Please join us for a very special gathering at Andy’s Orchard. Andy Mariani is a member of the California Rare Fruit Growers Association and specializes in artisanal fruit growing. He has been featured in Gourmet and Sunset magazines. He proudly grows/nurtures over 200 varieties of stone fruits, many of which aren’t available in stores. He has many heirloom varieties that are too fragile to transport to stores, but are extremely flavorful. Since he’s in “our own backyard” we have the opportunity to experience the fruits of his labor. Packing shed, drying yard, and orchard harvest walk. The Tasting – Andy Mariani will give us an intro to the Fruit Tasting - We can evaluate the balance of sweetness and acidity, astringency, texture/mouth feel, and aroma/bouquet. Or we’re welcome to act like kids in a candy store, and just dive in. Either way, it will be a great experience. Approximately 40-50 varieties will be sliced & in labeled containers for us to enjoy. 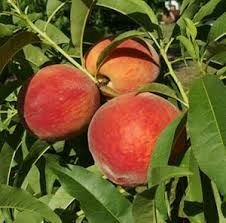 We’re hoping the Baby Crawford Peaches & Green Gage Plums will be ready for us to sample– but that all depends on the moods of Mother Nature in August! The Tour & Harvest Walk – We‘ll split up into 2 or 3 groups, each led by Andy or one of his skillful docents. We’ll learn about the local agricultural history, discuss varieties, cultivation, and storage. We’ll surely hear a few stories of the farm, which has been in Andy’s family for over 50 years. We’ll then head out to the orchard to some select trees to harvest from. There’s just nothing better than hand-selecting your own fruit, still warm from the heat of the summer sun! We’ll each have a 2-gallon bucket to place our fruit in. We’re welcome to eat what we like in the orchard, compliments of Andy. Any fruit brought out of the orchard will be charged at $2.50 per pound. Also, Andy’s has a little Country Store with fresh/dried fruits, nuts, confections, locally grown produce, and gift items. Looking forward to see you at the orchard!